William Inge is one of America’s greatest modern playwrights, earning a Pulitzer Prize for his 1953 “Picnic”, in which a young Paul Newman made his debut as Alan Seymour. It’s no wonder that Oklahoma City University included “Picnic” on the 2019 season. Directed by Kristen Cerelli, Assistant Professor of Acting and Voice at Oklahoma City University since 2016, “Picnic” features a fine student cast. The set design by Dustin Bielich is absolutely wonderful, creating the atmosphere around the two residences in the small Southern town. The lighting by Cadence Tyson further enhances the mood and setting; it is easy to feel the end of summer in the atmosphere. Reagan Williams does a wonderful job with the 50’s style costuming and the play begins. It is Labor Day weekend, and neighbors Helen Potts and Flo Owens are busy preparing for the annual picnic. Helen, a spinster, cares for her aging mother while accepting help around the house from a young man down on his luck. Hal Carter has come to town and hopes to find a job with the assistance of a university chum, Alan Seymour. In the course of his duties his shirt becomes filthy and Helen offers to wash it. Shirtless, Hal struts about gaining the admiring and shocked glances from the women in the two households. Flo is appalled, but her daughters, Madge and Millie, are not. Rosemary Sydney, the typing and shorthand teacher is another spinster, a desperate spinster, who pretends to be shocked, but her gaze is quite admiring! Millie, the young tomboy, is only mildly impressed, but Madge, the elder daughter, is fascinated by the adventure that Hal Carter represents. When Alan Seymour, Madge’s boyfriend, arrives, their friendship revives. But Alan cautions Hal not to drink or take advantage of any of the young women. Of course, the relationships must readjust and young love cannot be thwarted no matter the disapproval of the community. 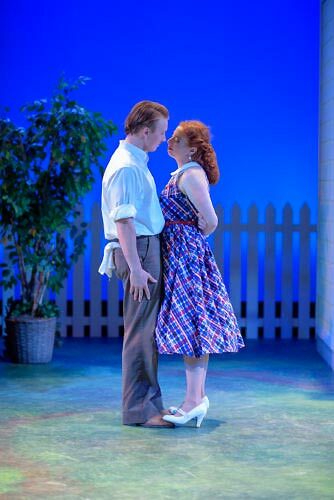 “Picnic” is somewhat dated as the somewhat repressive moral attitudes of the 1950’s in the heartland reflect, but the important themes within the play are universal and unchanging. Passion and young love will always be the most important thing on the minds of the young people in any society. Fear of becoming an old maid is still an issue for many young women and while there are other opportunities today for girls to develop, most of them still dream of being swept off their feet. The difference is choice, not feelings. Also jealousy will always rear its ugly head when lovers meet and part. As the action continues these emotions are developed by the cast and the play becomes quite relevant emotionally. Prior to his success as a playwright, Inge was a theatre critic, and perhaps the experience leads to his uncanny ability to leave no loose ends, hanging threads or questions. Cerelli as a director is able to take advantage of his excellent script with the cast. As the entire cast members are students, the various ages must be part of their acting repertoire and these students age beautifully. As a student at OKCU in 1974, the mirror reflected the age makeup applied quite accurately to the actual result seen in the mirror today, and they will also find it so. Adrianna DelPercia is Flo Owens, a middle aged woman disappointed in her own marriage. Her countenance is careworn and her performance shows her desire for her daughters to marry well, to land a good catch. She knows that love is not everything. Sydney Epstein is the beautiful and shapely Madge Owens, who does not appreciate her mother’s wisdom: she knows that love conquers all. The question is: does she understand the difference between love and sexual passion? Sara Byerly is the young tomboy Millie Owens, in the shadow of her elder pretty sister; she is also the smart and talented member of the family. The two sisters display disquieting sibling rivalry, yet underneath their love is apparent. Both Epstein and Byerly are fine actresses with an innately accurate appreciation for their craft. Tyler Malinauskas is the drifter, Hal Carter, with the look of an Adonis and the attitude of a Loki, Hal is a devious but gentle-hearted soul. Malinauskas reveals both sides of Hal’s personality and angst skillfully. Joey Witten is Alan Seymour, all-around good guy and great marriage catch. His father has wealth, his mother has class, and he is expected to follow suit. Madge likes him, but her mother expects her to love him for what he is rather than who he is. It is clear that experience teaches it is better to like and be secure than loved and abandoned. Madge is respectful as a dutiful daughter, but she doesn’t believe her mother. As a result, Alan and Hal must vie for the attention of Madge and they create a delightful courtship dance that can only come from the male human species. Their dance is very accurate. There are two spinsters who are more severely damaged by their marriage status than women of today. Helen Potts is relegated to caregiver for a termagant the audience never sees, but she keeps a healthy humor in her life. Maddie Gustitis gives Helen Potts that humorous touch with a delightful bit of lust in her eye that is whimsical. Rosemary Sydney is destined to become a bitter old maid unless she can get the shopkeeper boyfriend Howard Bevans to marry her. If she succeeds in dragging him to the altar, it may be the biggest mistake he’ll ever make. He knows it, and resists, but he also understands the obligation he is under. Mercedes Arndt is Rosemary and her outstanding performance creates much of the tension in the show. Dustin Dale Barlow is Howard, and he plays a 42-year bachelor with accuracy and just a touch of sympathy. Much of the humor also comes from two friends of Rosemary’s dropping by. They are younger teachers, single, but not yet jaded and they are glad to be alive, employed, respectable and young. Laura Kariuki is particularly quirky in her delightful character of Irma Kronkite. Katy Yates as the new teacher, Christine Schoenwalder, is impressed with Rosemary’s generosity and her embrace of the insincere Rosemary is awkward and quite amusing. Irma seems to have no issues about life. It is at her feet and she is aware that is so. She knows she is beautiful, smart and desirable. The appearance of these two on stage is a delightful contrast- joy is rare and they embrace the audience. Jordan Tanner Cobb is the young newsboy Bomber, who admires Madge, teases Millie and makes a general nuisance of himself. Although the part is small, Cobb certainly makes the most of his appearance. There are three swing performers whose unseen contribution is vital. Sophia Ciaverelli, Micah Gilley and Andrew Tompkins are far more than understudies; they have prepared to take over any role in the show if necessary. “Picnic” plays through April 7, 2019 at the wonderful Burg Auditorium on the OKCU campus at 25th and Blackwelder in Oklahoma City. Curtain is 8:00 for evening performances and tickets are available at the box office at 405-208-5227. Also visit www.okcu.edu/theatre for additional information about the show and other productions from Oklahoma City University.